Years ago buying a Louis Vuitton bag means owning classic for years. Now, LV has become very trendy with seasonal products which sometimes make me wonder why anyone will pay so much money for them and how does a gal keep up? Don't take me wrong, these products are usually very catchy in color or silhouette but I seriously have an issue paying $2580 for a synthetic rubber tote. 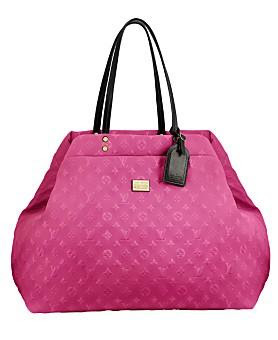 I saw the tote immediately, a gal would need to be blind to overlook this fuchsia tote. The material feels rubbery with a coating of powder. Of course the SA tells me it's made of Neoprene which sounds really high tech. Of course, synthetic rubber just won't sound as expensive or high tech. Yes ladies, neoprene is a Dupont trade name for its synthetic rubber which is used for products such as wetsuits, hint "Scuba" tote. So let me ask you this, will you pay close to $2600 for this bright LV tote or it's just me with my not-deep-enough-pocket? hey there, what an awesome blog you have. i completely agree with you about this LV bag... and about Coach. charming indeed! i'd love if you'd come visit my secret blog that's hidden from my blogger profile (heartshapedmorning.blogspot.com). Oh my God! Totally insane! I would NEVER pay that much for that bag! I love the color. But I won't spend so much on a bag that won't go wit almost all of my outfits! It is beautiful! Too bad it's plastic! It is a beautiful bag, love the color. Definitely over priced!! I agree, it's cute but yeah a total blow on cost. The cost is a total blow.. unless I have money to seriously blow.. I try to stick the classics = ) Great article.. It's crazy, especially in this economy. I will admit that LV bags are "comfortable" in that they don't slip off your shoulder constantly, etc. but all in all I am just not a big fan of LV. I don't find high-end brand names all that attractive to be honest -- I am more into one-of-a-kind pieces. I OWN IT AND LOVE IT. IT IS WORTH EVERY $. I love mine! The color is fabulous and the quality is superb.